The newest edition to our properties is amazing Sound View, located in Hall Quarry, Mount Desert! Hall Quarry is located about halfway between Somesville and Southwest Harbor on Mount Desert Island. It was once home to a thriving granite quarrying industry that provided stone to build such important structures as the National Mint in Philadelphia and the Brooklyn anchorage to the Manhattan Bridge in New York. Hall Quarry supported as many as five quarrying operations from 1870 to 1965. It is a peaceful and serene village that sits nestled in the hills on Somes Sound, the only natural fjard on the east coast and a popular sailing and pleasure boating destination, offering protected deep anchorages and spectacular views all year long. 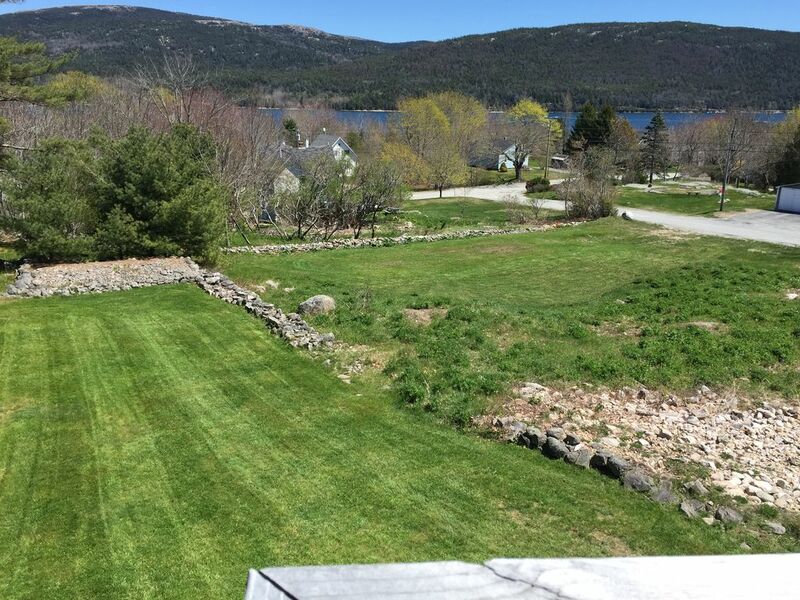 Sound View is a very spacious, meticulously decorated and a comfortable home away from home set amidst a huge manicured yard, overlooking the most spectacular and amazing views of Somes Sound, as well as beautiful Sargent, Bald Peak, Parkman and Norumbega Mountains. Relax in the most private setting while you sip your coffee on your very spacious deck and enjoy the ever changing breathtaking views! Watch the deer grazing all around you in the early evenings. Also take in our spectacular Maine Lupine flowering field in full bloom, along your view to the Sound (seasonally). Feel free to cut a few to have them for inside as well. We are just minutes (2 to 3 miles) to some of Acadia National Park's most popular hiking and biking trails, as well as great swimming at Echo Lake Beach. We are within 8 miles of downtown Bar Harbor and minutes to everything that our beautiful Island has to offer, without having to endure the lack of privacy with downtown properties and the huge crowds and noise from the cruise ship traffic while staying in Bar Harbor. Sound View has five lovely bedrooms and three bathrooms. It will comfortably accommodate a total of 12 (8 ADULTS / 4 CHILDREN MAXIMUM). It is delicately appointed with brand-new fine furnishings, flooring, upscale bedding and linens, housewares, etc. This amazing property provides you with everything you could possibly need! The beautiful gas fireplace is a perfect setting for cooler evenings. On the entrance level floor, there is a fully stocked kitchen leading to an open concept living room and sun-room dining area, both with large sliding glass doors to the spacious deck and gorgeous view. Lots of windows throughout allows for wonderful natural light. There is a master bedroom with a king sized bed and a smaller en suite bathroom, as well as a second bedroom with a queen size bed and a larger bathroom for the main floor to utilize. Wander downstairs where you will find two more queen sized bedrooms, one leading to what we call the bunk room. It has a bunk bed and trundle unit (sleeps 3 kids). Also downstairs is a great office space with a relaxing day bed and then a very spacious recreation room for lounging, watching television or playing one of the great games we have included. It also has a full bath attached, as well as a queen sleeper sofa. Our glorious views continue from every window. This house is perfect for extended families traveling together or multiple couples. There is a washer and dryer located on each floor for your convenience. Outside enjoy the very spacious back yard with a great fire pit for roasting marshmallows, a volleyball/badminton net for your added enjoyment and a horse shoe pit in the field. Please visit our other properties: Listing # 3814222 Seascape also located in Hall Quarry sleeps 8, listing # 3900896 Lilac Lane sleeps 8 located in the Village of Northeast Harbor on Mount Desert Island! Soon to be added is a sister property to this located across the street boasting 4 bedroom 2 bath to accommodate another 11 for great reunions! My husband, myself and our two boys most recently acquired Sound View. My husband and children are all natives to Hall Quarry and I am originally from Massachusetts. We also reside in Hall Quarry, Mount Desert. This property is very near and dear to my husband. It was his grandfather's property originally. It was then passed on to his uncle. A lot of great memories were made gardening and horseback riding with his grandfather when he was young. We were delighted we were given the chance to retain this property within the family. Lots of property both inside and out to stretch out and enjoy! A lovely house with lots of room and lots to do. The house is lovely with striking views and lots of space for a big family gathering. We had such a good time - despite the rain and clouds - enjoying the World Series on the satellite tv, sitting around the fire pit (on a night with no rain), watching the deer in the yard, hiking park trails, cooking meals in the large, well equipped kitchen, and enjoying a couple of meals out - in Bar Harbor and Southwest Harbor. Erica and Randy were amazingly responsive to the few messages we sent them. We would love to make this an annual outing. Lovely home! Clean and nicely renovated. Great views! This was a wonderful home base for our explorations of Acadia and all of Mount Desert Island Only about 20 minutes into Bar Harbor and less than that to the park. Nearby Beech Mountain Loop Trail was quite the workout, scrambling over the rocks up and down. it is a great home with lots of space to spread out, and Erica is a very helpful host. Would definitely stay here again. This place was absolutely awesome. We flew in for a long weekend Columbus day weekend. The view is amazing, the deer were abundant. THE HOUSE - was amazing! Was suppose to be 4 couples but that changed to 3 couples. We each had our own bedroom (all said beds were great! ), baths tidy and plenty of hot water. The kitchen nice and roomy as well as the living. Big table where we ate, talked, played cards. Could easily leave sliding doors to deck open and talk. It really was perfect... and me being quite the a clean freak this says a lot. Lots of little extra's we didn't expect in the drawers & cabinets. We all highly recommend any and all stay here!! Clean, well appointed, great location in a beautiful region! Everything we needed was at our fingertips in the lovely, clean home and in the Acadia region. Would stay here again! Perfect Home for your vacation stay! We had a wonderful stay at Soundview! The home is beautiful, comfortable, nice and clean, comfortable beds, clean linens and it had everything we needed for a week stay! There were 9 of us in total - 4 adults and 5 kids and there was plenty of room for all of us! The kids thoroughly enjoyed having the downstairs area to themselves - with their own TV, sitting area, play area, bathroom and beds! It was perfect! The firepit and deck were also perfect for dinner and drinks after a long day of exploring the area. The house is also within an easy distance from Acadia Park Loop and lots of wonderful hikes, lakes, ponds, etc. I highly recommend a stay at Soundview! Nice location. Plenty of room. The firepit and outdoor deck were pluses. The place was clean and pretty well maintained. We enjoyed our stay there. There were a few minor things which could be improved. Handwritten notes were left on the table when we left. The biggest one was one of the downstairs bathrooms was very slow to drain. Our grandkids use a lot of cups. Plastic colored cups which could be assigned to a child (rather than the clear glassware) would have been preferred.